For visitors who want to travel off of the beaten path, Kansas City has several unique and quirky attractions. From working miniature dueling pistols and famous bullet holes to shrunken heads and 132-year-old pickles, the Kansas City metro has it all. With 159 wreaths and more than 2,000 pieces of jewelry made from, or containing human hair, this museum in Independence, MO. is recognized as one of the most unusual museums in the country. You'll also find art and buttons made from human hair, in addition to the famous locks of Marilyn Monroe and Abraham Lincoln at this quirky museum. 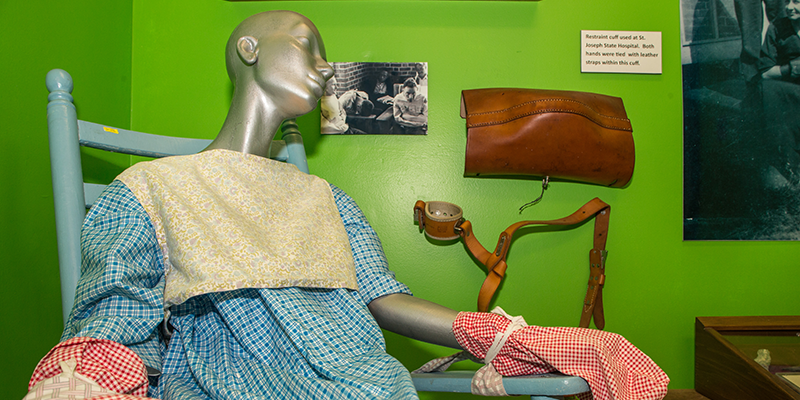 Recognized as "one of the 50 most unusual museums in the country," this eccentric museum in St. Joseph, MO, illustrates the history of the treatment of mental illness through full-sized replicas, interactive displays, audio-visuals, documents and artifacts such as dousing tanks, cages and straightjackets. You'll also see a collection of more than 1,400 metal objects, such as nails and safety pins, which were swallowed by a single patient. This museum in Kansas City, MO, explores the golden age of air travel. You'll see the paper dresses worn by TWA flight attendants in 1968. They had to carry staplers and tape in an attempt to keep their dresses from falling off during the in-flight service. Another display showcases the complimentary cigarettes that were given to every passenger. One can only hope that the smoking passengers didn't get too close to the paper-clad flight attendants. It’s not all about carousels at this museum in Leavenworth, Kan. A quirky exhibit upstairs takes a look into the world of old carnivals and sideshows. You'll see two shrunken heads, a Fiji Island Mermaid and a petrified human hand. There is a piece of steel that was tied into knots by the world’s strongest man, a sword-swallower’s sword and a collection of rings that belonged to giants. This museum, located in the River Market of Kansas City, displays the artifacts of the steamboat Arabia when it sunk in 1856. You'll see an exhibit showing jars of fruits and vegetables, which were sealed so well that when one of the excavators sampled a 132-year-old pickle, he said it tasted perfectly fine. Perhaps the most bizarre object in the museum’s collection is the skeleton of a mule, which was the shipwreck’s only casualty. This eccentric museum of American history in St. Joseph, MO, features a hodgepodge of quirky artifacts and memorabilia. Some of the oddest things you'll see are a 1920s gas station, the dentist office of Walter Cronkite’s father, a collection of spittoons, an 1880 general store, a horse-drawn hearse and a 1,050-pound ball of string. The museum building formerly served as the headquarters for the Pony Express in 1860. Legendary outlaw Jesse James was killed in this house in St. Joseph, MO, on April 3, 1882. Fellow gang member Robert Ford shot James to collect a $10,000 reward, creating the legendary bullet hole. Now behind a protective frame, the bullet hole is now nearly a foot wide after years of being picked at by tourists. Moved from its original location, the building is now sits on the grounds of the Patee House Museum. Children and adults are equally intrigued by the unique objects in this museum in Kansas City, MO. The most quirky display features a pair of fully-dressed fleas that can be viewed under a microscope. Other exhibits include a 1:12 scale pair of dueling pistols that are one-inch long and actually function, a nine-foot tall dollhouse, and a Victorian swimming doll. This attraction in Independence, MO, has several unusual puppets. The creator of the Harry S. Truman marionette used his own hair on the puppet’s head because he could not find any artificial hair that he liked. You'll also see the puppet, Sister Mary Annette, which is featured in all six of the off-BroadwayNunsense plays. Other exhibits include the history of “Punch” from the famed Punch & Judy and a display of puppets from around the world. This house, located in Johnson County, Kan., showcases the futuristic, up-and-coming technology of the 1950s. You'll see hidden televisions, electric curtain openers and trendy appliances. Once a family home, the house is now part of the Johnson County Museum’s collection, which tells the history of the area from a suburban perspective.